Delicious kebabs with a definite Polynesian flavor that hints of sweet and sour with tones of ginger. Dovetailing Tip: Prepare extra skewers of chicken in preparation for the Hawaiian Rice. Any leftover grilled veggies can be chopped and added to the versatile Hawaiian Rice. Drain pineapple, keep 1/2 cup juice. Mix juice with the next 7 ingredients in small pan. Remove chicken from marinade, reserve marinade. 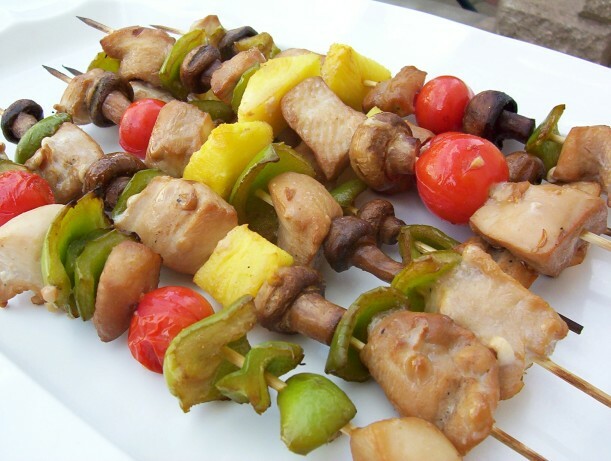 Alternate chicken, pineapple, green pepper, mushrooms, and tomatoes on skewers. Grill kabobs over hot coals 20 minutes or until chicken is done. Turn and baste frequently with marinade.